Last night, I recorded a movie the Discovery Channel has been hyping for some time now... and it's scary as hell (although nothing could ever be as scary as Candyman). It's not about the boogeyman or psycho killers, or even some strange virus, but one of the world's largest, active underground volcanoes - what the Discovery Channel has so insidiously called a Supervolcano (warning: sound will start when you click this link). It's not in a far away land, it's under Yellowstone National Park and it has the capability of ejecting more than 8,000 times the amount of volcanic ash than the 1980 Mt. 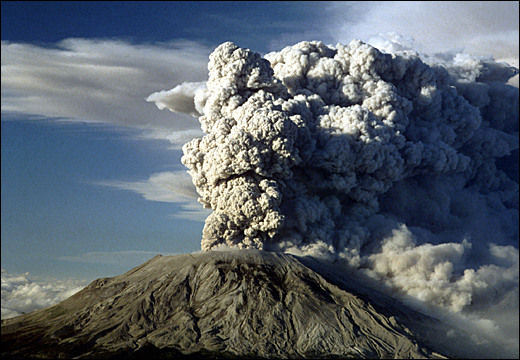 St. Helens eruption, spreading a blanket of dense, toxic ash over the entire west, south west and central part of the United States... even most of California (which seems to have its own supervolcano). Additionaly, such a large cloud would block out sunlight all over the earth, causing temperatures to drop and crops to fail. Maybe it's because I'm running a fever and I'm a natural worrywart, but although the real Yellowstone scientists say it's very, very unlikely such a super eruption will occur in our lifetime, if ever, just seeing the horrors that potentially lie beneath Wyoming really makes me want to go out and buy emergency supplies and some really good respirator masks. Learn about the Yellowstone volcano on this cool interactive page. The show will re-air this Saturday, April 16 at 5pm and 8pm on the Discovery Channel. Although I don't suggest you watch it because it'll either just make you worried or convinced that I worry too much. You should see Saw too. We were supposed to see Saw together. Also, discovery channel specials on tsunamis. Saw wasn't scary. I'm so glad we didn't get to see it on Halloween because it wasn't scary enough to be worth missing out on Castro Street fun. I thought it was too slow and Cary Elwes was fat, which just made me sad. Tsunamis are scary, but I'd say that the super volcanic eruption that can change earth's climate for decades and cover my house and my lungs with toxic dust has a slight scary-edge. We should get together and watch scary movies... or scary Discovery Channel shows. That would be fun. ha, yacinto the UPS man came into fdap and was talking all this doomsday stuff about volcanos, and now I see what show he was watching.